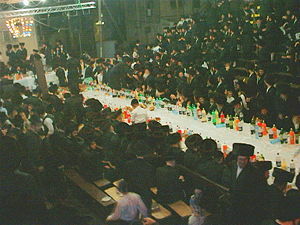 English translation: "Booths" or "Tabernacles"
Observances Eating in sukkah, taking the Four Species, hakafot in Synagogue. Sukkot (Hebrew: סוכות or סֻכּוֹת, sukkōt ; "booths") is a major Jewish festival, also known as Succoth, Sukkos, the Feast of Booths, or the Feast of Tabernacles that occurs in autumn on the fifteenth day of the month of Tishri (late September to late October). Lasting seven days, it is one of the three major holidays known collectively as the three pilgrim festivals, when, in ancient times, the Jewish populace was expected to travel to the Temple in Jerusalem for the celebration. 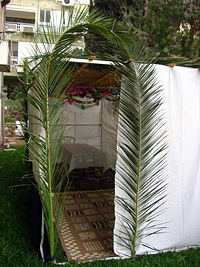 During Sukkot, observant Jewish families eat, sleep, and entertain guests in temporary outdoor shelters know as sukkahs. Traditionally, the holiday commemorates the time when the Israelites lived and worshiped in portable structures in the wilderness under the leadership of Moses. However, it may have originated as a harvest festival, and critical scholars believe that the connection to the wilderness period was written into the tradition after the fact. The holiday is a particularly joyous one, in which Gentiles as well as Jews are invited to participate. According to the biblical books of Exodus and Deuteronomy, Sukkot had an agricultural origin. It was known, among other titles, as the "Feast of Ingathering" and was to be held "at the end of the year when you gather in your labors out of the field" (Ex. 23:16) and "after you have gathered in from your threshing-floor and from your winepress" (Deut. 16:13). It was apparently similar to the pagan festival described in Judges 9:27: "After they had gone out into the fields and gathered the grapes and trodden them, they held a festival in the temple of their god." Coming as it did at the completion of the harvest, Sukkot was regarded as a general thanksgiving for the bounty of nature in the year that had passed. You are to take choice fruit from the trees, and palm fronds, leafy branches and poplars, and rejoice before the Lord your God for seven days… Live in booths for seven days: All native-born Israelites are to live in booths so your descendants will know that I had the Israelites live in booths when I brought them out of Egypt (Lev. 23:40-43). Some scholars consider this passage to be an insertion by a late redactor to give the agricultural harvest festival a more ancient authority linked to the Israelite wilderness tradition. The Book of Deuteronomy, also thought by critical scholars to represent a late tradition, speaks of Moses instructing the Israelites to gather for a reading of the Law during Sukkot every seventh year (Deut. 31:10-11). 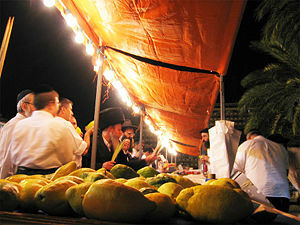 Sukkot eventually became one of the most important feasts in Judaism, as indicated by its designation as “the Feast of the Lord” (Lev. 23:39; Judges 21:19) or simply “the Feast” (1 Kings 8:2, 65; 12:32; 2 Chron. 5:3; 7:8). Important state ceremonies were associated with it. According to the biblical histories, King Solomon dedicated the Temple in Jerusalem on Sukkot (1 Kings 8; 2 Chron. 7). In the northern Kingdom of Israel, Jeroboam I, celebrated a festival on the fifteenth day of the eighth month, one month after the southern version of Sukkot (1 Kings 12:32-33). It was also the first sacred occasion observed after the resumption of sacrifices in Jerusalem after the Babylonian captivity (Ezra 3:2-4). Nehemiah, writing after the Babylonian exile, reported a lengthy lapse in the tradition of dwelling in booths, as “the Israelites had not done so from the days of Joshua” (Neh. 8:13-17). According to Zechariah (Zech. 14:16-19), Sukkot in the messianic era will become a universal festival, and all nations will make pilgrimages annually to Jerusalem to celebrate the feast there. Sukkot is here associated with the granting of rain, an idea further developed in later Jewish literature. Observance of Sukkot is also detailed in rabbinical literature, including the Mishnah, Tosefta, Jerusalem Talmud, and the Babylonian Talmud (Mishnah Sukkah 1:1–5:8; Tosefta Sukkah 1:1–4:28; Jerusalem Talmud Sukkah 1a–; Babylonian Talmud Sukkah 2a–56b.). 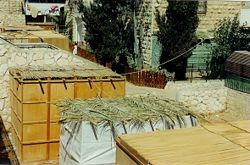 Sukkahs with different types of walls and roofing. The word sukkot is the plural of the Hebrew word sukkah, meaning booth or hut. In preparation for the holiday, Jews are instructed to build a temporary structure called a sukkah, in which they eat their meals, entertain guests, relax, and even sleep. Tables, chairs, and beds or mattresses are moved from the house into the sukkah, which may also be fitted with lighting, heaters, book shelves, and other furniture for the comfort of the users by day and by night. The decor of the interior of the sukkah may range from very plain to lavishly decorated with pictures, tapestries, hanging fruits, and ornaments. 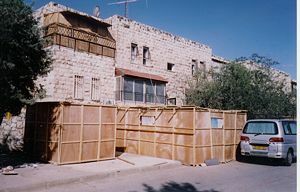 According to Jewish law, the walls of the sukkah can be made from any material, including wood, canvas, plaster, or regular walls of glass or aluminum. The roof, however, must be of organic material that is detached from the ground. Palm fronds, branches, bamboo, and wood are the most common roofing materials. In modern-day Israel (and among Reform Jews), the first day of Sukkot is celebrated as a full festival with special prayer services and holiday meals. Among Orthodox and Conservative Jews outside of Israel, the first two days are celebrated as full festivals. Prayers during Sukkot include the reading of the Torah every day, saying additional prayers after normal morning prayers, reading the Hallel (a recitation from Psalms 113-118), and adding special supplications to the daily Amidah blessings and to grace after meals. On the first day of Sukkot (the first two day, outside of Israel), the prayer services are extended, taking a form similar to that of the Sabbath. During each day of the holiday, Jews invite seven spiritual "guests" to be spiritually present with them in the sukkah. Known by the Aramaic word ushpizin, these include: Abraham, Isaac, Jacob, Moses, Aaron, Joseph, and David. According to tradition, each night a different one of the ushpizin enters the sukkah first and the other six follow. Each of the ushpizin has a unique lesson to teach, which parallels the spiritual focus of the day on which they visit. In recent times, some Jews add seven spiritual women, or ushpizot, who also enter their sukkah. These are the biblical Sarah, Miriam, Deborah, Hannah, Huldah, Abigail, and Esther. The custom of inviting guests to the sukkah extends to earthly guests as well. Many people invite family, friends, neighbors, or people who are alone to join them for a snack or a meal. As the celebration is a joyous one, wine and strong drink may also be consumed, with story telling and laughter extending long into thr night. Anyone, including non-Jews, are more than welcome inside a sukkah. The second through seventh days of Sukkot (third through seventh days outside the land of Israel) are called Chol haMoed (חול המועד—literally, "festival weekdays"). This means that all activities that are needed for the holiday—such as buying and preparing food, cleaning the house in honor of the holiday, or traveling to visit other people's sukkahs or on family outings—are permitted by Jewish law. However, activities that will interfere with relaxation and enjoyment of the holiday—such as laundering, mending clothes, engaging in labor-intensive activities—are not permitted. Observant Jews typically treat Chol haMoed as a vacation period, eating nicer than usual meals in their sukkah, entertaining guests, visiting other families, and taking family outings. On the Sabbath which falls during the week of Sukkot, the Book of Ecclesiastes is read during morning synagogue services in Israel. (Diaspora communities read it the following Shabbat). In ancient times, once every seven years, all Jews on pilgrimage to Jerusalem for the Sukkot festival would gather in the Temple courtyard on the first day of Chol haMoed to hear the Jewish king or other official read selections from the Torah. This ceremony, which was mandated in Deuteronomy 31:10-13, was held in the year following the Sabbatical year. A unique service was also performed every morning throughout the Sukkot holiday: The Nisuch HaMayim (נסוך המים—lit. "pouring of the water"). The ceremony invoked God's blessing for rain in its proper time. The water for the joyous libation ceremony was drawn from the Pool of Siloam in the City of David. The ceremony is thought to be the source for the verse in Isaiah: "And you shall draw waters with joy from the wells of salvation" (Isa. 12:3). Every night in the outer Temple courtyard, thousands of spectators would gather to watch the Simchat Beit haShoeivah ("Rejoicing at the Place of the Water-Drawing"), as the most pious members of the community danced and sang songs of praise to God. The dancers would carry lighted torches, and were accompanied by the harps, lyres, cymbals, and trumpets of the Levites. A mechitza (partition separating men and women) was erected for this occasion. These traditions were discontinued after the destruction of the Second Temple in 70 C.E., but it has been revived by some groups and by the government of Israel on a smaller scale. Nowadays, Simchat Beit haShoeivah is recalled via a gathering of music, dance, and refreshments. It takes place in a central location such as a synagogue, yeshiva, or place of study. 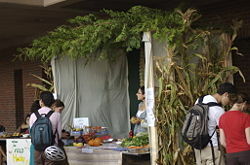 Food and drink are served in an adjoining sukkah. Live bands often accompany the dancers. The festivities usually begin late in the evening, and can last long into the night. 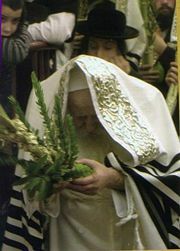 In the synagogue during each day of Sukkot, worshipers parade around the synagogue carrying date palm fronds (lulavim) and citron fruit and reciting Psalm 118:25: "O Lord, grant us success." This commemorates the Aravah (willow) ceremony in the days of the Temple in Jerusalem, in which willow branches were piled beside the altar and worshipers paraded around the altar reciting the same verse. The seventh day of Sukkot is known as Hoshana Rabbah (הושענא רבא, "Great Supplication"). This day is marked by a special synagogue service in which seven circuits are made by the worshipers as above, while the congregation recites Psalm 118:25 and additional prayers. It is customary in some communities for all the Torah scrolls to be removed from the ark and lead this procession. In addition, a bundle of five willow branches is taken and beaten against the ground, accompanied by a series of liturgical verses expressing hope for the speedy coming of the Messiah. Among Sephardic Jews, poetic prayers known as selichot are recited before the regular morning service (these are the same prayers recited before Rosh Hashana). In Amsterdam and in a few places in England, America, and elsewhere, the shofar is also sounded in connection with the processions. The latter practice reflects the idea that Hoshana Rabbah is the end of the high holiday season, when the world is judged for the coming year. The day immediately following Sukkot is known as Shemini Atzeret (שמיני עצרת—lit. "the Eighth [Day] of Assembly"). In Israel, the celebration of Shemini Atzeret includes that of Simchat Torah. Outside the land of Israel, Simchat Torah is celebrated on the second day of Shemini Atzeret. Simchat Torah (שמחת תורה—lit. "the joy of the Torah") is an especially happy celebration. Symbolizing a new beginning, the very last portion of the Torah is read in the synagogue during morning services and the very first portion of the Torah (the beginning of Genesis) is read immediately after this. Both during the night service and the morning service in Orthodox synagogues, all the Torah scrolls are removed from the ark and the worshipers engage in rounds of spirited dancing. Seven official circuits around the reader's table are made, although the dancing can go on for hours in some congregations. And it shall come to pass that everyone shall go up from year to year to worship the King, the Lord of Hosts… and to keep the Feast of Tabernacles. Whichever of the families of the earth does not go up to Jerusalem to worship the (AG)King, the Lord of hosts, there will be no rain on them (Zechariah 14:16-18). The holiday is considered to be an occasion on which Jews and Gentiles can easily co-mingle in celebration of God's bounty and blessing. In Israel's synagogues today, Christians, Muslims, and others are especially welcome at the Simchat Torah service. the Feast of Booths, was near… So Jesus said to them [his brothers], "Go up to the feast yourselves…" He stayed in Galilee, but when his brothers had gone up to the feast, then he himself also went up, not publicly, but in secret… Some were saying, "He is a good man;" others were saying, "No, on the contrary, he leads the people astray." …When it was now the midst of the feast, Jesus went up into the temple, and began to teach. The Jews then were astonished, saying, "How has this man become learned, having never been educated?" So Jesus answered them and said, "My teaching is not mine, but his who sent me (John 7:2-16). The name Sukkot also appears in a number of places in the Hebrew Bible as a location. Sukkot (or Succoth) was a city east of the Jordan River, identified with modern Tell Deir Άlla, a high mound in the plain north of Jabbok (Josh. 13:27). This is where Jacob, on his return from Padan-aram after his reunion with Esau, built a house for himself and made sukkot (booths) for his cattle (Gen. 32:17, 30; 33:17). In the Book of Judges, the princes of Succoth (Sukkot) refused to provide help to Gideon and his men when they pursued a band of fugitive Midianites. After routing this band, Gideon visited the rulers of the city with severe punishment (Judg. 8:13-16). In the time of King Solomon, foundries for casting the precious metal-work of the Temple of Jerusalem were erected at Succoth (1 Kings 7:46). Donin, Hayim. Sukkot. Jewish Publication Society of America, 1988. ISBN 978-0827603028. Goodman, Philip. The Sukkot and Simhat Torah Anthology. Philadelphia PA: Jewish Publication Society of America, 1973. ISBN 9780827600102. Rubenstein, Jeffrey L. The History of Sukkot in the Second Temple and Rabbinic Periods. Brown Judaic studies, no. 302. Atlanta, GA: Scholars Press, 1995. ISBN 9780788501302. This page was last modified on 7 October 2016, at 14:51.